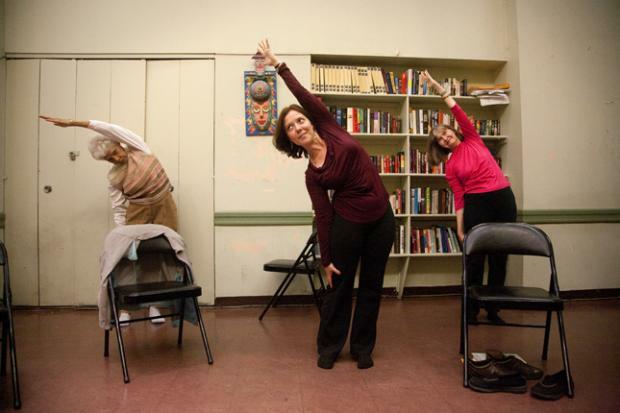 Maria Tapia, David Reich, Judith Pietrasiewicz, Christa Avampato and Valerie Leiman are part of a volunteer-run Upper West Side group, Bloomingdale Aging in Place. Architects and advocates have been discussing ways to help the city's growing elderly population stay put in age-friendly ways. MANHATTAN — Jeanine Plottel, a retired Hunter College professor who lives on the Upper East Side, was not alone when she walked up 14 flights of stairs to her apartment during the blackout of August 2003, just after having hip surgery. Her building's superintendent and doorman supported her, carrying a stool for Plottel to take frequent breaks. “Elderly people need more help than some realize,” Plottel, now 79, said. She and her husband of 57 years call on their building's staff when they need curtains hung, a mattress turned over or even a tight-lidded jar opened. But many other older New Yorkers aren't as lucky as the Plottels. 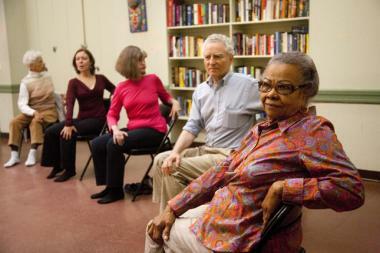 Some 132,800 New Yorkers aged 65 and older are at risk of social isolation, according to data from the city's health department. The most common risk factors are living alone, not working, not belonging to community or religious groups, and poor health, according to a report from Age Friendly New York City, an initiative by the city and New York Academy of Medicine that is focused on improving the urban environment for older adults. As the city's over-60 population is expected to hit 1.8 million by 2030, architects are brainstorming how design can help with physical needs as well as encouraging community. Just as child-safety window grilles and smoke detectors are now mandatory, a yearlong initiative by a committee from the American Institute of Architects' New York Chapter has devised a "toolkit" of features they hope will also become required, such as improved lighting and handrails in stairwells. The architects' ideas for "Booming Boroughs: Redesigning Aging in Place in NYC" — the subject of an exhibit at the AIA's Center for Architecture in Greenwich Village from Jan. 9 through Feb. 1, 2104 — address the needs of those in walk-ups as well as those who live in elevator buildings. And many advocates tip their hats to the important roles doormen and supers provide for elderly New Yorkers. “You would be surprised of what gets done in a doorman building,” said James Rauscher, a super at an Upper East Side building. Rauscher has heard of building staff helping older residents with everything from recording TV shows, to setting up tables and chairs for bridge games, to responding to falls before EMS workers arrive. He teaches a human relations course to building workers in 32BJ SEIU's union, which includes a seminar from the Hebrew Home for the Aged about helping older residents who might be suffering from dementia or other issues. “The people who work in this industry want to take care of the people who live in the building," Rauscher said. Here are some ideas from architects to transform housing for older New Yorkers. Handrails on both sides of a stairwell allows for greater mobility and safety, explained Jerry Maltz, co-chairman of AIANY's Design for Aging Committee. Better lighting is crucial, too, because if it's not sufficient, people may have difficulty finding the rails, he added. Using contrasting surfaces and textures can help older residents use more of their senses, Maltz explained. "It's not just sight but touch: to feel their way through," he said. "It's important not to have slippery surfaces, patterns that could be confusing and not easily visible." Putting lockers in a lobby is an important — and perhaps surprising — convenience that could help. People could use them for heavy coats or umbrellas or other items they might need outside, Maltz suggested. Forgetting these things once you've already walked downstairs, for instance, can be tricky for those who have mobility challenges. "In some cases it can be a major obstacle to being active and going to the outside," he said. "This is also a device for perhaps becoming more friendly to one's neighbors." Sharing books is a good device for developing commonality with neighbors and gives neighbors something to talk about, Maltz said. "If you're all reading the same books you can talk to each other or have a sense of what you want to read," he said. "In any sort of emergency those can become important relationships." Though this could be tricky to do in narrow corridors, architects suggested exploring ways to have places to rest, which could be a big help for older people walking two or three flights of stairs, Maltz said. This is a major change for buildings, but could potentially work for certain brownstones with backyards, for instance, Maltz said. Giving seniors places to sit outside "and organizing them into a real place," Maltz said, fosters people leaving the house. He suggested having tables and chairs with arms (to help people brace themselves when getting up and sitting down) that can be reached via ramps. Some buildings with large lobbies or large passageways on the ground level have the potential for being furnished with bookcases and coffee machines, for example, and lit for reading, to encourage people to come together, Maltz said. "If there's a concierge in the building, he or she can serve as a catalyst to encourage conversation," Maltz added. The architects discussed the possibility of housing some basic health services in the ground floor or basement of buildings that could be used by residents or others in the community, Maltz said. Make sure elevators can operate at all times, with back-up systems in case of electrical outages, Maltz said. Combining some individual apartments could provide social and economic benefits for residents, especially those with healthcare needs, the committee said. "This is tricky because a lot of seniors may not want to move and you don't want to force them," Maltz said, noting the controversial proposal to downsize seniors living in large public housing units. "But co-housing is a nice idea. It has the advantage of preventing isolation or diminishing it significantly."